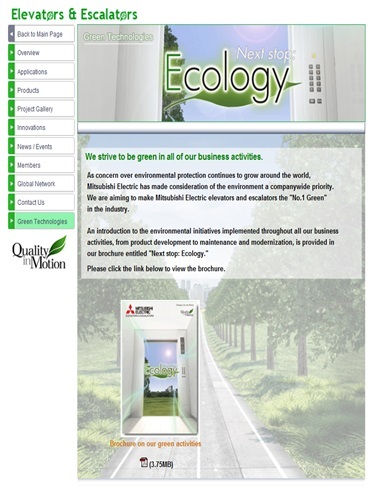 Mitsubishi Electric is committed to providing the greenest overall solution for vertical transportation. By application of advanced technologies, we can provide this for the entire delivery chain from design through to installation. Our strict adherence to overall product and maintenance quality provides the essential longevity to avoid the environmental impact and unnecessary cost associated with premature lift replacement. Our equipment is designed to maximise BREEAM points for your building. We can provide assistance for selecting the most energy efficient arrangement of lifts to secure the first point, the offer the following to secure the second; 'Sleep' mode, variable frequency drive, regenerative drive and low energy lighting. We can reduce raw materials in the lift equipment and supply requirements. The application of our variable speed elevator drive system provides a higher rated speed, under balanced conditions, whilst using a lower rated motor. Further energy-saving benefits are available with our 'Artificial Intelligence' for larger groups. This can prioritise energy-efficient loading during quieter periods and allocate the lifts appropriately at busier times to maximise service quality.